What is a "burgee"? 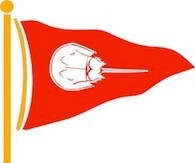 a flag bearing the colors or emblem of a sailing club, typically triangular. What is an Optimist (Opti)? 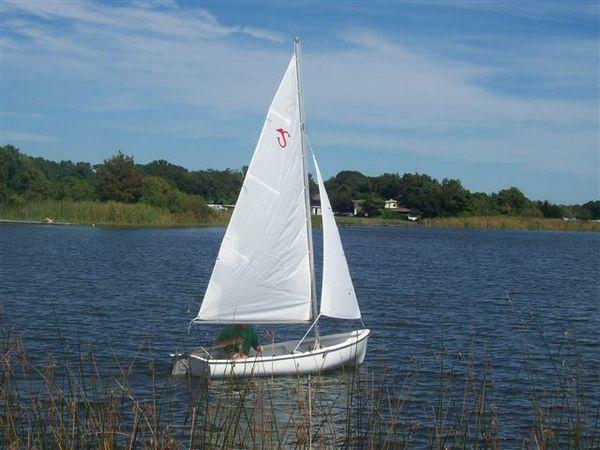 a small, single-handed boat with a single sail intended for use by children up to the age of 15 that is ideal for teaching kids more technical aspects of sailing. What is a c420? 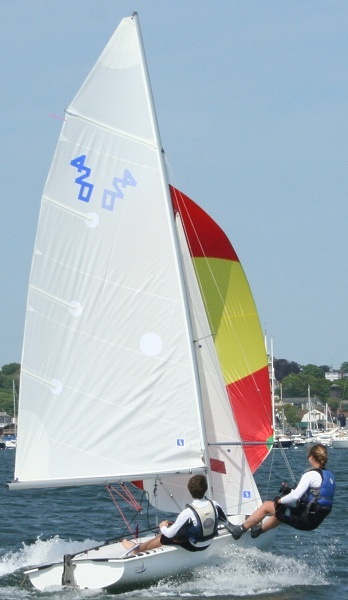 a double-handed (2 crew) boat with multiple sails used by teens and adults for racing. What is an O'Pen Bic (Bic)? The O'pen Bic is a single handed, single sail boat suitable for young teens. What is a Sprite? 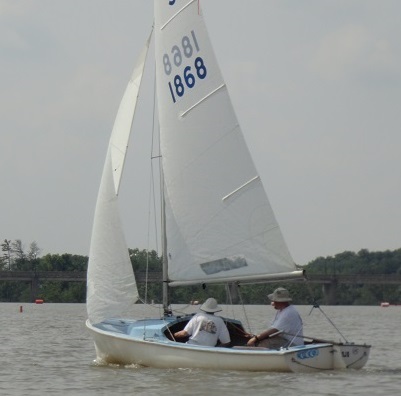 A 10' boat often used by sailing programs to acquaint younger sailors with boat maneuvering and handling. Can be sailed with one or two sails and can accommodate several crew members. At SHYC Seamen sail these in small groups with an instructor, in Mates they sail in small groups supervised by an instructor in a nearby motor boat. When do I register my child for sailing school? Registration opens in February, early bird discounts are given through the Spring. We encourage people to register early so that the Club can best prepare for the season, but understand that schedules change, which is why we allow changes on any registration to made at any time and refunds are given up until the first day of sailing school. What is the schedule for sailing school, can we register for just one week? Sailing School runs for 8 weeks from late June through mid-August. 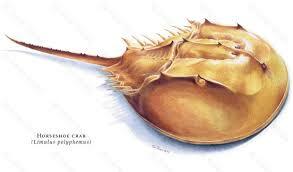 The program is divided into 2 four week sessions, but students are not limited to signing up for those 4 or 8 weeks. While the program is best enjoyed by participating in one or both sessions from start to finish, students may sign up for any combination of multiple consecutive or nonconsecutive weeks (2,3,4,5,6, or 7). How do I register my child for sailing school? Please visit the step-by-step registration instructions for an overview of the process, or email us with any questions. How do I find out which are the right classes for my child? Please reach out to David Leary with any questions. What information can I edit and see on my profile? What can other people see about me? How do I open My Profile? How do I fill out the contact information form? How do I see the menu options for My Profile? What is an "Organization" and how do I edit mine? What is a Key Contact and how do I change our household's Key Contacts? I don’t know my member login information. Member login credentials were emailed to every SHYC member who has a registered email address with the Club. Access to certain sections of the SHYC website is restricted to members only. Please log in as a member to gain access. When a member logs into the SHYC site, the Member Center tab will appear on the top navigation bar. What is a Member Profile and how do I update mine? Each member of SHYC has a Member Profile containing contact information such as summer and winter address, cell and home phone numbers, and email address. 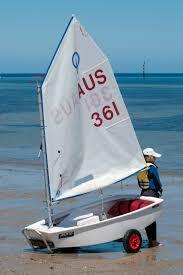 Children's profiles also include sailing school class (to be posted before the summer). When you log into the SHYC site, your Member Profile will appear. Click “Edit Profile” and make any necessary changes. Be sure to hit the “Save” button at the bottom of the page. Note: some information on your profile, such as date of birth, is kept for Club and Membership purposes but is not displayed on your directory profile. Do my children have Member Profiles too? Yes, each member of the Club, including children, has a Member Profiles with unique login credentials. How do I access my children’s Member Profiles? All parents may access their children's profiles by logging into SHYC.com through their own accounts. Additionally, children may login to their own accounts through their own unique user ID and password. Can I change my Member login credentials? If you would like to change your login and password information, you may do so by clicking the “Edit Profile” icon in your Member Profile. Be sure to hit the “Save” button at the bottom of the page. Why am I receiving multiple copies of the same email? We send most email communications to each adult Member and send some emails to all members, including children. If you have used the same email address for multiple members of the same household, it is probable that you will receive multiple copies of all email correspondence. Should you wish to receive only copy, please remove duplicates of the same email address from yours and your family members' profiles.